Like2sea sleepwear focus on natural and comfortable fabric,better detail disposal,perfect clipping and beautiful design. Providing you good sleeping feeling you have never try before. S: TOP length 28.7", Bottom length 16.5", Sleeve length 9.4", Shoulder width 18.1", Chest 46.1"
M: TOP length 29.5", Bottom length 16.9", Sleeve length 9.8", Shoulder width 19.1", Chest 48.0"
L: TOP length 30.3", Bottom length 17.3", Sleeve length 10.2", Shoulder width 20.1", Chest 50"
XL: TOP length 31.5", Bottom length 17.7", Sleeve length 10.6", Shoulder width 21.3", Chest 52"
Silk-like fabric: Premium silk-like satin pjs for men,100% polyester. 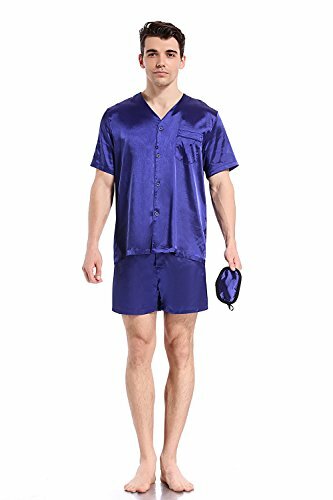 Pajamas Top: Full button-down front with pocket on Chest.Featuring this pajama T-shirt easy to put on off and just offer you a convenient secure lounge in summer. Sleepwear Bottom: This PJ pants feature an elastic waist to make you feel comfortable in daily dress or when you sleep. If you have any questions about this product by Like2sea, contact us by completing and submitting the form below. If you are looking for a specif part number, please include it with your message.